Pictured is Libby and Fairfield President Dixon Mitchell. 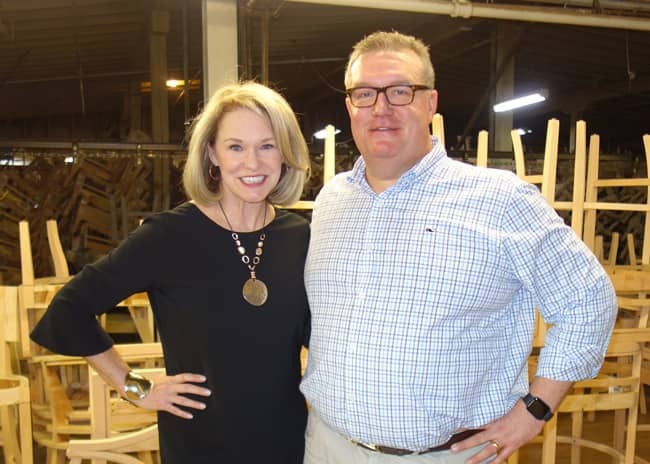 Furniture manufacturer Fairfield Chair Company announced that it is partnering with interior designer, television personality, author and lifestyle expert Libby Langdon on a complete home collection, upholstery and casegoods including the brand’s first line of bedroom furniture, all of which will launch this October during High Point Market. Bringing her sophisticated-but-livable aesthetic to the namesake collection, Langdon is designing a total home line of over 40 SKUs featuring upholstered seating—sofas, sectionals, chairs, dining chairs, benches, ottomans, and chaise lounges—as well as case goods, a category debut for her. “I’ve designed upholstery before but have always wanted to enter into the world of case goods and flex those design muscles,” said Langdon of the opportunity to create dining, cocktail and end tables, as well as dressers, etegeres, buffets, and consoles. The collaboration represents a fresh take for the heritage furniture maker, which has deep roots in Lenoir, NC. After a chance meeting with Dixon Mitchell, Fairfield President and COO, and Jim Craven, Vice President of Sales, last October Market, Langdon reacquainted herself with the company and was not only enthusiastic about the updated design direction, but saw an opportunity for the brand to reach a new group of buyers and designers with her designs. Plus, she saw a way to enhance the brand’s offerings with one particular area of expertise. The resulting designs in the collection will pair Langdon’s signature "Easy, Elegant, Everyday Style" with timeless precepts, all courtesy of Fairfield’s artisans. “I’m so impressed with Fairfield’s capabilities as a company and manufacturer: everything from wood finishes, to intricate construction, to metal options. I feel like I can really create what I want without limits, and still have it come in with incredible quality and a great value,” Langdon said. This idea of creating products that are sophisticated, but approachable is a common thread that connects all the products she designs: lighting for Crystorama, rugs with KAS, outdoor furniture for NorthCape, and, most recently, wall décor for Paragon, which will also debut at the October Market. "We're thrilled to partner with Libby on Fairfield's first licensed collection," said Mitchell. "We feel she’s the perfect person to collaborate with, especially considering where we are now as a company. Her perspective and style will be a wonderful addition and help us expand our current looks and design aesthetic. We’ve loved all the designs and ideas she’s brought to us. She brings a tremendous amount of energy, experience and knowledge to the table, and has a clear understanding of what consumers want. We bring our expertise in manufacturing, quality craftsmanship, and ability to produce furnishings that are standards of value and excellence. Together we are going to create dynamic collections with special design details that speak to consumers' lifestyles and help them announce their own personal style." Just like Fairfield, Libby’s North Carolina roots run deep—she considers High Point her hometown and has parents who worked in the industry (her dad was in textiles and her mom a designer). For this reason, she feels that everything about this partnership is perfectly aligned, and nothing is better than that! About Libby Langdon: Libby Langdon is an interior designer, author, product designer, and television personality as well as the creative force behind New York City–based design firm Libby Interiors, Inc. She is known for her growing collections of branded home-furnishing collections, including lighting for Crystorama, rugs for KAS, outdoor furniture for NorthCape, and most recently artwork for Paragon, which will deput in October 2019 at High Point Market. Her interior design work and home products have been featured in leading shelter magazines, including Architectural Digest, House Beautiful, Traditional Home, Hamptons Cottages & Gardens, Better Homes and Gardens, and Woman’s Day. Langdon has been a regular design expert on NBC’s TODAY Show, HGTV’s Small Space, Big Style, The View, The Rachael Ray Show, The Early Show and NBC’s Open House. Langdon travels across the country presenting her design seminars to consumers, designers and retailers about all things design.